Fight or Exterminate - Pest Control Alabama | Bama Exterminating Company Inc.
You walk into your laundry room only to notice a large black spot on the wall, as you near the wall you realize that this is no black spot, You begin to make out thick black legs, yellow spots, and a rather large torso. You shiver with disgust. It is time for the ultimate battle. You prepare yourself, armed with a shoe, paper towel, and Windex, you approach your arachnid nemesis. You swiftly swing the shoe at the spider, with a smack he falls to the floor, scurrying across the hardwood. You strike again, this time finishing the job. Guts splatter, leaving the spider adhered to the floor. You use your paper towel to wipe away the body and windex away the remains. The fight is over and you have persevered. With warmer weather in full swing, comes more creepers and crawlers making their way into your home. You can count on finding at least a few spiders, moths, crickets, and earwigs in your home this summer. Having a few of these creepy crawlers is pretty average for a home owner, but what happened when you are finding more than a few? 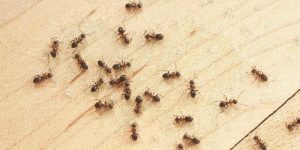 If you have to have a few too many face offs in your home, it may be time to call pest control to your home. Bama Exterminating Co. is your local pest control company to protect your home. Contact us today if you believe that you may have a pest problem! We would be more than happy to complete a pest control inspection.